Trusted Spotter Network Austria – a new standard to utilize crowdsourced weather and impact observations Trusted Spotter Network Austria Thomas Krennert et al. Information from voluntary storm spotters has been an increasingly important part for the severe weather warning process at the Zentralanstalt für Meteorologie and Geodynamik (ZAMG), Austria's National Weather Service, for almost 15 years. In 2010 a collaboration was formalized and an annual training was established to educate voluntary observers into “Trusted Spotters”. The return of this investment is a higher credibility of their observations after these spotters have undergone a basic meteorological training and have become aware of their responsibility. The European Severe Storms Laboratory (ESSL) was included to this collaboration to adopt their successful quality control system of severe weather reports, which is employed in the European Severe Weather Database ESWD. That way, reports from Trusted Spotters automatically obtain a higher quality flag, which enables a faster processing by forecasters on duty for severe weather warnings, when time is a critical issue. The concept of combining training for voluntary storm spotters and a thorough quality management was recognized as a “Best Practice Model” by the European Meteorological Society. We propose to apply this concept also in other European countries and present its advancement into an even broader, pan-European approach. The European Weather Observer app EWOB, recently released by ESSL, provides a novel and easy-to-handle tool to submit weather and respective impact observations. We promote its use to provide better data and information for a further real-time improvement of severe weather warnings. Krennert, T., Kaltenberger, R., Pistotnik, G., Holzer, A. M., Zeiler, F., and Stampfl, M.: Trusted Spotter Network Austria – a new standard to utilize crowdsourced weather and impact observations, Adv. Sci. Res., 15, 77-80, https://doi.org/10.5194/asr-15-77-2018, 2018. Automatic weather stations can measure meteorological parameters like temperature, wind, and precipitation with high accuracy, at high temporal resolution and under standardized conditions. However, small-scale (severe) weather phenomena may easily slip through a station network undetected. Besides, weather station data cannot directly reflect the impact of a particular weather phenomenon on the local environment. Examples of phenomena which may adversely affect our activities or even (local) societal well-being are flash floods, damaging wind gusts, hail, fog, black ice, drifting snow, rime, and many others. Not even precipitation phase changes between rain, snow, freezing rain, or ice pellets can reliably be registered by meteorological instruments yet without the assessment of human observers. The automatization of weather station networks and the significantly reduced numbers of official weather observers have therefore left a void of “ground truth” information. Several reasons make it important to complement the data from automatic station networks with non professional human observations, which add potentially valuable information about weather conditions and their impact also between discretely placed stations. First, they help climatologists to improve the assessment of weather-related risks and their impacts. Second, they act as a basis for verification and subsequent calibration of severe weather warnings. And, when available in real-time, information about severe weather phenomena and their impact provides essential feedback which helps a forecaster on duty to immediately issue severe weather warnings, or to properly adjust those warnings already in effect. 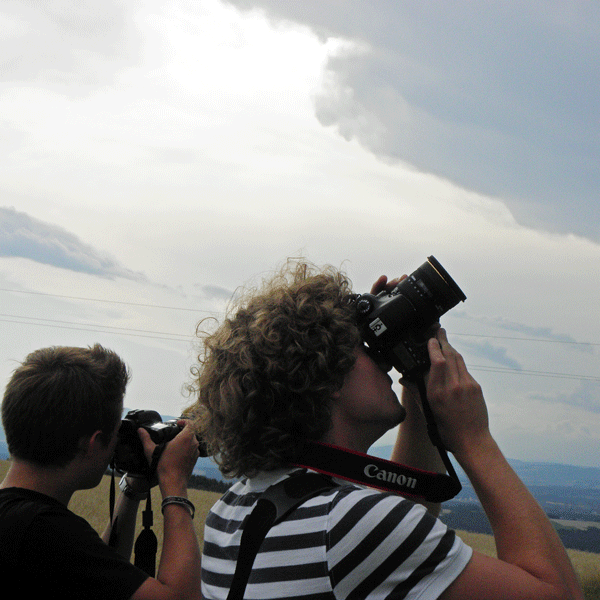 In Austria, amateur weather observers and storm chasers are organized in the non-profit organization Skywarn Austria. The Austrian National Weather Service (Zentralanstalt für Meteorologie und Geodynamik, ZAMG) recognized the importance of severe weather reports from these voluntary observers in critical weather situations, developed the necessary infrastructure to make them available in real-time to its forecasters, and established a training program for the voluntary observers to increase the reliability of their reports. The European Severe Storms Laboratory (ESSL) was included into this collaboration to feed the severe weather reports also into the European Severe Weather Database (ESWD) and to adopt the quality control mechanisms applied therein. This collaboration between Skywarn Austria, ZAMG and ESSL is beneficial to all involved parties, and we advocate it as a role model for other European countries. The two pillars of this system are described in the following two sections. Section 2 presents the training concept and the win-win situation it creates for both parties: forecasters and voluntary observers. Section 3 explains the ESWD quality control procedure and its application to real-time storm spotter reports. Finally, Sect. 4 concludes this paper with a prospect how the successful structures could possibly be applied also to other countries, and hence, raised to the next, pan-European level with the release of the European Weather Observer (EWOB) app by ESSL. The non-profit organization Skywarn Austria was founded in 2003 as a result of increased networking among amateur weather enthusiasts across Austria. Its goal is to collect real-time information about hazardous weather events and to distribute it as widely as possible to prepare the public and to mitigate severe weather impacts, following the well-established prototype Skywarn organization in the USA. As the number of Skywarn Austria members increased continuously over the years, ZAMG recognized the potential of their provided information and channelled the enthusiasm of the involved people into a collaboration which turned beneficial for both sides: forecasters at the ZAMG offices started to utilize severe weather reports from Skywarn Austria members for their warning duties, and Skywarn Austria increased its publicity and its consciousness of being an acknowledged part in the warning procedure. In the meantime, more than 100 members actively contribute to Skywarn Austria, including about two dozen “storm chasers” who do not only observe the weather at their whereabouts but are also willing to drive somewhere to experience thunderstorms in their immediate vicinity. Participation in a one-day training workshop. This workshop includes presentations of professional meteorologists on interesting topics related to severe weather, hands-on exercises, own contributions by participants, and plenty of discussions and informal exchange of experience in-between. It is offered on an annual basis at the ZAMG headquarters in Vienna and at its regional offices in Graz and Salzburg. “Shadowing” of a forecaster on duty during his/her shift. Spending a shift together enables a forecaster and a voluntary observer to get to know each other personally and to build mutual trust. The storm spotters become aware of the responsibility of severe weather warnings and their contribution in this process. After running through this training procedure once (see also Fig. 1), a Skywarn Austria member becomes a Trusted Spotter. This status awards his/her reports a higher level of credibility and grants him/her special access to some internal meteorological data (station, radar, satellite, or forecast model data) which further satisfy the demand for meteorological information. A varied and situational flexible program maintains the attractiveness of the workshop even for multiple attendances. This offer is indeed readily accepted, and many Trusted Spotters join on a yearly or almost yearly basis despite no imperative of coming again after a one-time completion of the training. The great interest and enthusiasm of these storm spotters is further reflected by the large number of own contributions to these workshops (e.g., case studies, photo and video material of interesting weather phenomena) and joint discussions, which form a considerable part of the workshop program. Along with the establishment of the TSN training courses, also the reporting criteria for severe weather phenomena were formalized, and a quality control system was introduced to allow a forecaster an immediate distinction between reports of Trusted Spotters and those of “basic” spotters in the often time-critical context of severe weather warning. For this purpose, ESSL was included into this collaboration. The Skywarn Austria reporting criteria were synchronized with those of ESWD, and ESWD's well-proven quality control system was adopted to handle also reports from voluntary storm spotters of different training levels. In return, the Skywarn Austria TSN reports are also imported into ESWD in real-time. Figure 1Storm Spotters during field observations (a), during a job shadowing (b), and during a practical exercise at a Trusted Spotter Network Workshop at ZAMG, Vienna (c). ESWD was established in 2006 by ESSL to store event-based information on severe weather occurrences (large hail, severe wind gusts, tornadoes, excessive rainfall or snowfall, freezing rain …) across Europe in an internationally homogeneous and processible format (Dotzek et al., 2009). Special emphasis is placed on a prompt entry of latest severe weather reports, though historical events are also added as resources permit. Clearly defined reporting criteria ensure that only those weather events are stored from which notable damage was either directly observed or at least highly likely according to meteorological parameters (e.g., hailstone sizes > 2 cm, wind gusts > 25 m s−1, or rainfall measurements above a defined threshold curve). Details can be found in the ESWD event reporting criteria document (https://www.eswd.eu/docs/ESWD_criteria_en.pdf, last access: 5 May 2018). QCO: “as received”. The lowest quality flag is the “port of call” for reports from unknown individuals or unclear sources. Each QCO report is reviewed by ESSL staff as soon as possible to either raise it to a higher quality flag or to delete it. QC0+: “plausibility checked”. This quality flag applies to reports from people whose identity is known but who have not undergone a targeted meteorological training. It may also be assigned to reports from otherwise credible sources but with incomplete or missing prove (e.g., second-hand information without further evidence). QC1: “confirmed”. QC1 is the standard quality flag given directly to reports from trained people, complete media articles, relief unit operations, or for reports with included photo or video material. QC2: “fully verified”. The highest quality flag is only rarely awarded for events covered by a thorough site survey or a detailed study (e.g., a scientific paper). The distinction between these different quality levels allows users to filter ESWD data according to their own needs, both for climatological purposes and for real-time applications like severe weather warnings. The trilateral collaboration between ZAMG, Skywarn Austria and ESSL is beneficial for everyone involved. It is the most advanced of such collaborations in Europe and was awarded “Best Practice” by the European Meteorological Society in 2016. A survey among European National Meteorological Services, which was conducted concomitantly to our study, showed that an increasing number of them are utilizing spotter reports, but none of them links training and quality control in our way yet (Krennert et al., 2018). However, we do not only want to advocate a mere copy of this formula for success to other countries, but we also wish to give a prospect of a broader, pan-European level of employing the general public into the severe weather warning process. In early 2017, ESSL released its European Weather OBserver application for mobile phones (EWOB, https://www.essl.org/ewob/, last access: 5 May 2018), which offers a new, simple way to submit a variety of weather observations and information about their impact. It is not limited to severe weather events any more. It therefore does not require the observers to be trained or conscious of challenging reporting criteria. The generalization from “severe weather observations” to any kind of “weather observations” reduces the efforts of reporting to a minimum and can attract a larger number of people. Despite the success of TSN Austria, it shall be clear that significant resources are necessary to ensure the training process of voluntary observers, and that only a limited number of people is interested enough to care about specific reporting criteria, undergo this training and become a Trusted Spotter. In contrast, still a large number of people exist whose enthusiasm is not big enough to shoulder these efforts, but who are yet ready to informally report on observed weather conditions when stimulated. This is also evident from the multitude of reactions to weather-related information on social media sites of e.g. newspapers, TV or radio stations, or mere chat-rooms. EWOB aims at these people by alluring them with an easy interface for reporting and an appealing graphic display of their immediate reporting “success”. In contrast to a naturally limited number of high-quality reports on severe weather events that can be gained from a network of Trusted Spotters, the potential value of EWOB data inheres in their quantity instead of their quality. Realistically the majority of reports to the EWOB database will be given by untrained observers, thus, the report is given without quality control. However, their sheer number awards them collective information. Users can focus on those reports relevant for their individual purposes. For example, reports of fog, freezing drizzle, phase changes between snow and rain, small hail, or strong wind gusts are not high-impact events yet, but may be first indications of higher-impact situations to evolve. In particular, those EWOB reports meeting ESWD criteria may be sorted out and in a next step saved in the ESWD database after a customary quality control. Due to the simplicity of the procedure and the permission to report any kind of weather, EWOB constitutes a more general approach to engage citizens into weather forecasting and warning. Ideally, a system of Trusted Spotters shall be included into such a broader approach. Both concepts – the emphasis on quality of a Trusted Spotter system and the emphasis on quantity of the EWOB approach – are complementary for an employment of the general public into an effective feedback loop, which can improve the nowcasting and warning of high-impact weather situations. Dotzek, N., P. Groenemeijer, Feuerstein, B., and Holzer, A. M.: Overview of ESSL's severe convective storms research using the European Severe Weather Database ESWD, Atmos. Res., 93, 575–586, https://doi.org/10.1016/j.atmosres.2008.10.020, 2009. Krennert, T., Pistotnik, G., Kaltenberger, R., and Csekits, C.: Crowdsourcing of weather observations at national meteorological and hydrological services in Europe, Adv. Sci. Res., 15, 71–76, https://doi.org/10.5194/asr-15-71-2018, 2018.